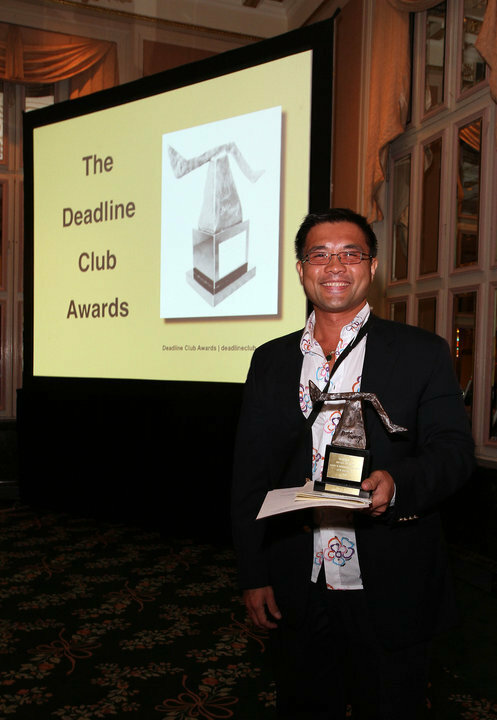 — The DEADLINE CLUB, the New York City chapter of the Society of Professional Journalists, honored the best of the best in New York area journalism June 7 at the Annual Dinner of the DEADLINE CLUB AWARDS, one of New York City’s most prestigious journalism awards. Randy Gener won the 2010 Deadline Club Award for Best Arts Reporting in New York – printed, broadcast or otherwise disseminated in 2009. Beating The Forward and The New York Times in the specialized writing category, Gener received a Rube Goldberg bronze statue from Deadline Club president, Rebecca Baker and keynote speaker Robert Thomson, managing editor of The Wall Street Journal and editor-in-chief of Dow Jones & Co.
Gener won for “Fomenting a Denim Revolution,” which appeared in the May/June 2009 international theatre edition of American Theatre, published by Theatre Communications Group. This magazine article chronicles the plight of the guerilla artists of Belarus Free Theatre who perform underground in Minsk while arguing openly for regime change. The Deadline Club recognized more than two dozen winners and scores of finalists who were deemed the best in New York area journalism – printed, broadcast or otherwise disseminated in 2009 by news organizations based in and around the New York City area. With 29 categories, the focus ranged from newspapers to radio and television to online. Winners in the other categories this year included journalists from The New York Times, The Associated Press, Newsweek, Newsday, Vanity Fair, Fast Company, Sports illustrated, CNN, News 12 Westchester, and Jazz Loft Project Radio Series. The Deadline Club in New York City is one of the largest chapters of the Society of Professional Journalists. Its members include professionals working in broadcast, print, online and journalism education. The Club maintains the New York Journalism Hall of Fame and elects and inducts its members. The most important mission of SPJ and its chapters is fostering and defending freedom of the press under the First Amendment of the U.S. Constitution. SPJ sends its constitutional lawyers to the aid of journalists who need assistance in exercising their rights. The Deadline Club has been serving the cause of New York City journalism for nearly 80 years.